I got down to Dorking beer festival on Saturday, and event run by Surrey Craft Beer. 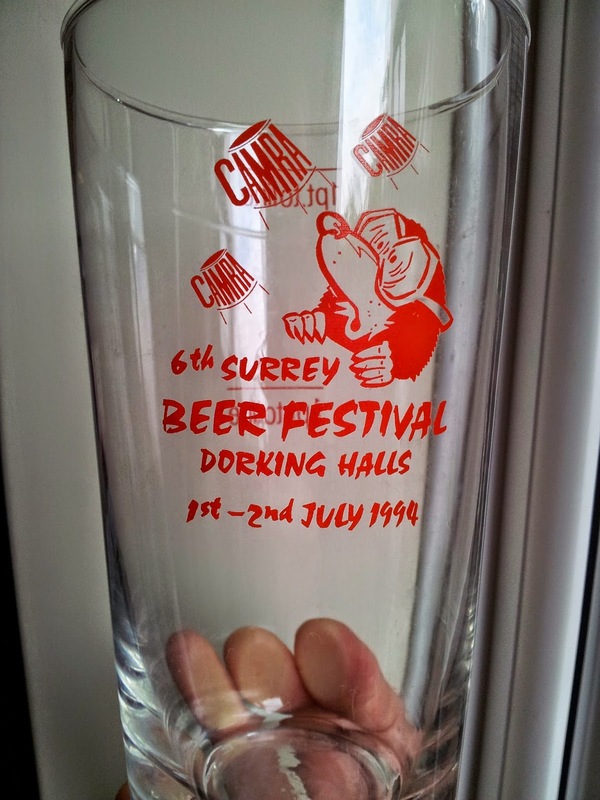 It was billed as Dorking's first beer festival, though unlike the organisers I can remember the previous CAMRA festival, though admittedly it is a couple of decades since it stopped. The beer range was surprisingly small for a beer festival, so I went straight for pints. I was hoping to find a mild but it was not to be. It's looking like it's going to be a mildless may for me. The beer was bright, didn't really show them at their best so I won't comment further on them. I had a great time though. Sitting out in the sun drinking beer has a lot to be said for it. We headed off when it started to get cold, after only modest intake for a beer festival. 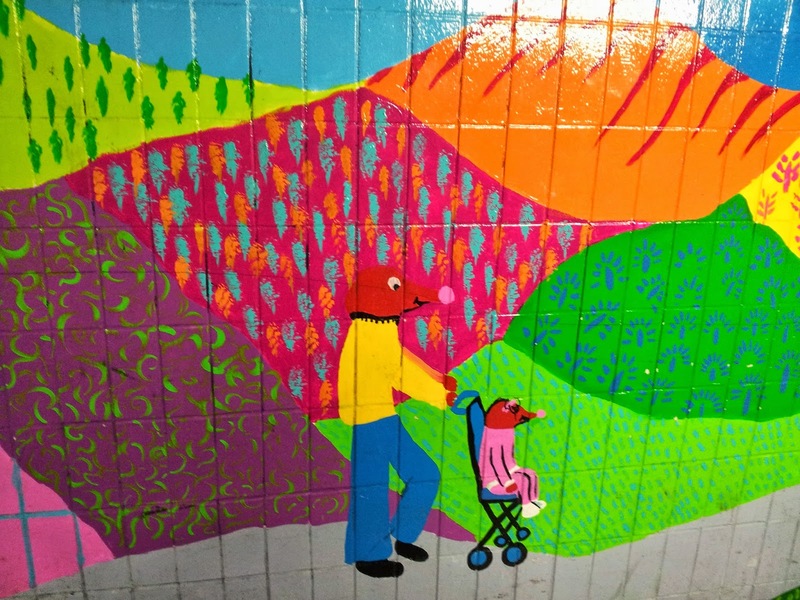 It was quite enough though for us the fully appreciate the mural in a subway on the way home. They must have some strong acid in Dorking. 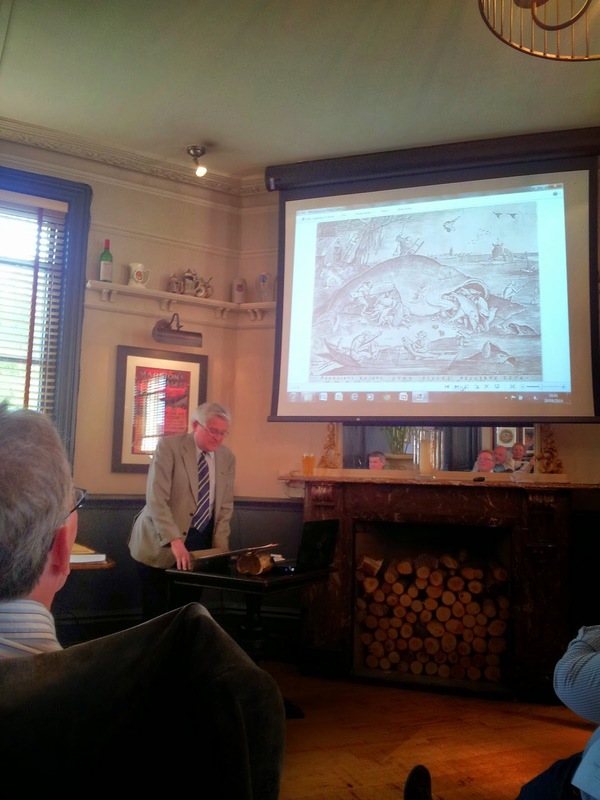 The other week I got to hear Chris Marchbanks talk about brewery history. The subtitle gave away what's happened to a lot of the breweries: big fish eat little fish. With the number of microbreweries ever increasing it almost seems strange to think that for a long time the only way brewery numbers went was down, but of the 400 breweries left after the second world was there are only 56 still around. The talk was wide ranging, covering the brewing industry and factors that have affected it, as well as Chris's own career which started at Ansells, before it became part of Allied. I'm not sure I can draw together a coherent account of all he covered,so I'll try and scape together some fascinating facts from my scribbled notes. The 1830 Beer House Act also move duty from beer to malt. The beer barons really took off after Allsopp's and Whitbread's were Incorporated. Ornate breweries were built in the 1880s and 1890s, the scramble for pubs took off in 1890. In 1914 there were 3600 breweries in Britain. WWI deaths causes succession problems for breweries. The 1931 budget was not good for beer. Allied Breweries was originally called ICTA for Ind Coope, Tetley, Ansells, and had eight breweries, maltings, a hop farm and of course thousands of pubs. Pilot malting and brewing trials for new barley varieties (the reason I was recently in Edinburgh) started after the then new variety Julia caused serious viscosity problems when used for brewing. Breweries would make their own hop extract by boiling hops with potassium hydroxide. Party Sevens came from when Metal Box didn't sell enough paint tins. Ansells were the first to use them in 1962. Originally they were coarse filtered but not pasteurised which lead to loads being returned. The high spot of British beer production was 79/80 at 41 million barrels. This lead to production for 1985 being forecast as 49 million, but in fact it was 38 and it's been downhill ever since. In 1983 (before The Beer Orders) Allied Breweries had made clear where their priorities lay by stating that they are retailers vertically integrated into breweries, not breweries that own tied houses. Continuous fermentation was tried in various ways but outside of New Zealand was abandoned (not that it's stopped people looking at bringing it back). The Big Six ended up at retailers, selling their breweries to international concerns with long histories of brewing but not retailing. 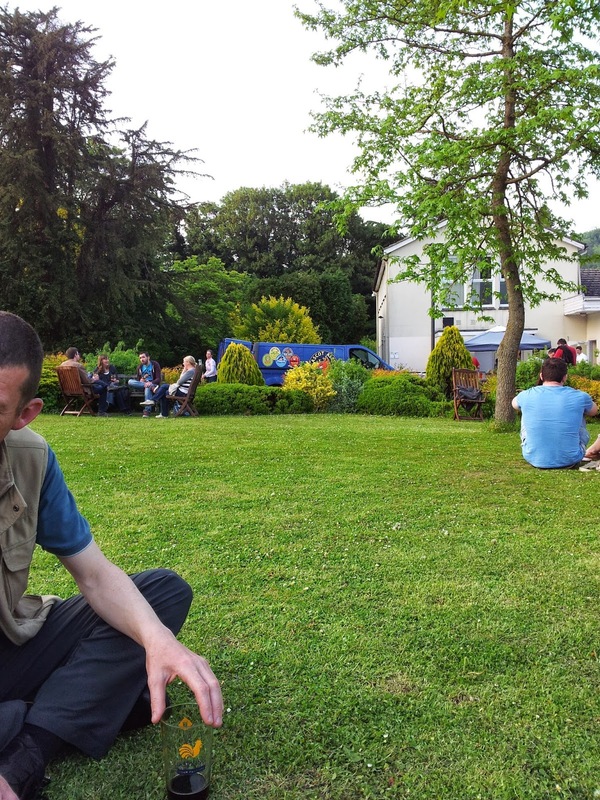 Chris was followed by Nigel Sadler of Wibblers Brewery (and a whole host of beery organisations). When the scheduled speaker couldn't make it he stepped in to give a talk on the rise of Craft Breweries. The thing that most struck me from his talk was the statement that in the UK people want farmhouse cheddar at dairylea prices, and there are probably too many breweries already. Certainly one to think about and it will be interesting to see how things work out. To rock or not to rock? Amongst my fellow beer nerds there has been some discussion of late on the best way to deal with cask beer in the cellar. One point of controversy has been whether casks should be rocked and rolled to give a good mix before stillaging. That's certainly what I was taught, but I don't always bother if I've had to roll the cask a considerable distance to get to the stillage. 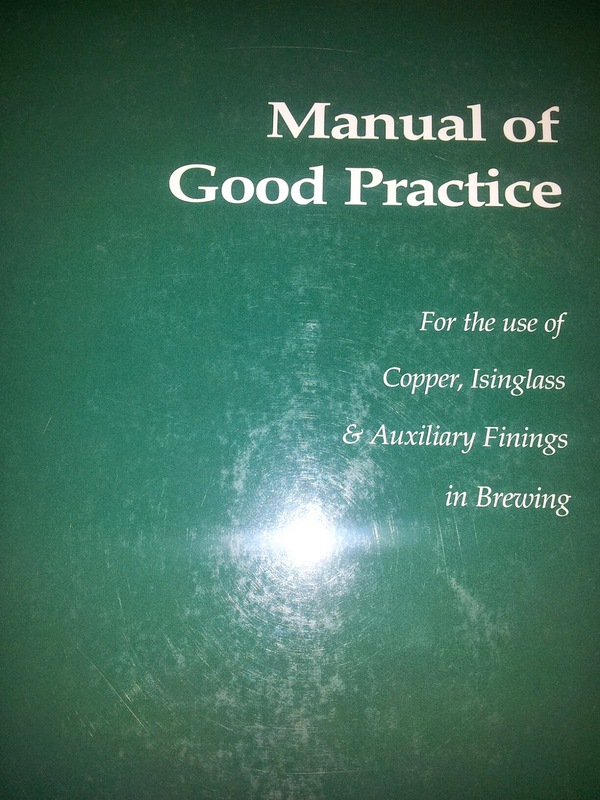 Seeking a definitive answer to this conundrum I looked in the library at work and found The Manual of Good Practice for the use of Copper, Isinglass and Auxiliary Finings in Brewing. Reports of the optimisation of supernatant clarity with respect to agitation exist for yeast and trub, and a considerable quantity of work has been carried out on the influence of agitation on natural yeast floculation. It seems that a certain degree of agitation is beneficial or even necessary for natural yeast floculation, but that over floculation causes yeast flocs to break up. However, no work has been found on the agitated floculation of yeast in the presence of a floculating agent. So no definitive answer yet. I suspect it's one of those questions to which the answer is "it depends". There's not doubt about it that often history has got it wrong. Let's face it, the good guys always lose, and frequently end up dying in a hail of bullets. But much as we might like to go back and tell Mr Mühsam to leave a day early, or have a word about icebreakers with Petrichenko sadly such things can't be done. But with beer history things are different. We might not be able to drink long lost beers, but it's perfectly possible to try and re-create them based on historical records, which often leads to great tasting beers we can hope our brewing ancestors would be proud of. And it seems it's not just in brewing that history can be turned around. One of my historical beer related obsessions has been the Farnham Whitebine hop, my blog post becoming the basis of my magnum opus in the Journal of the Brewery History Society. 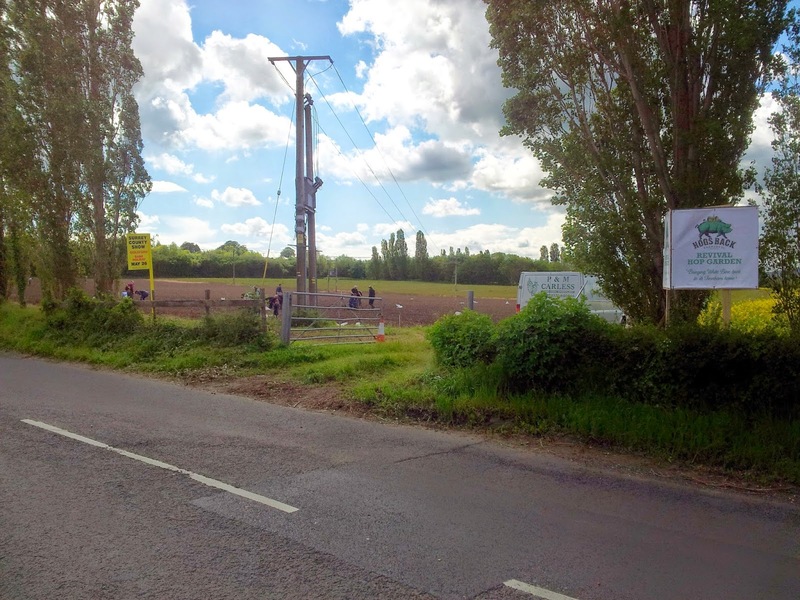 For the journal article I had a more upbeat ending than on the blog, mentioning that though hops were no longer grown in Farnham, one hop farm in the wider Farnham area survived and the pockets of Fuggles grown on the Hampton Estate continue to proudly bear the Farnham Bell. I did think there was always the possibility for them to return to their roots and plant some Farnham Whitebines too, though it seemed wishful thinking. 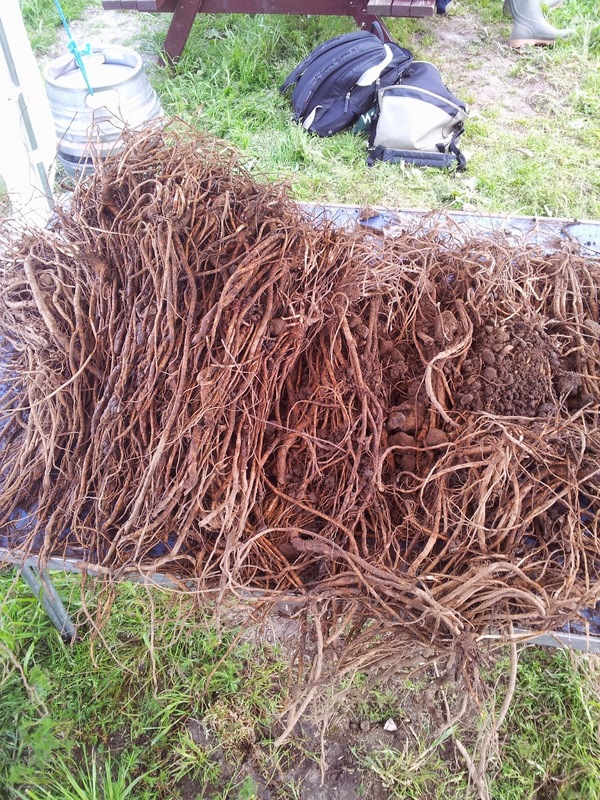 So I was astonished to hear that Hogs Back Brewery were looking into planting Farnham Whitebines on a commercial scale. As for obvious reasons I tend towards pessimism I didn't get too excited about it until I heard the plants had been ordered. After that I had to accept that a great historical error was going to be corrected. Which lead to me driving to Tongham filled with excitement, when once I would have been filled with dread (but that's another story). 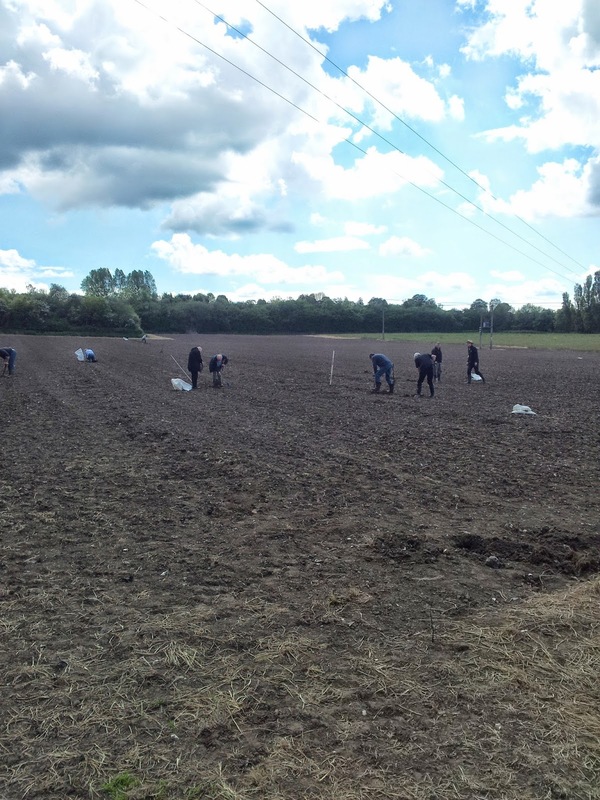 The hops (a combination of Whitebines and Cascade) are going in a field opposite the brewery. and a sign proudly proclaims that the Whitebines are back. I could only get there in the afternoon but helped with planting a few. ... and I can't wait to see them grow. 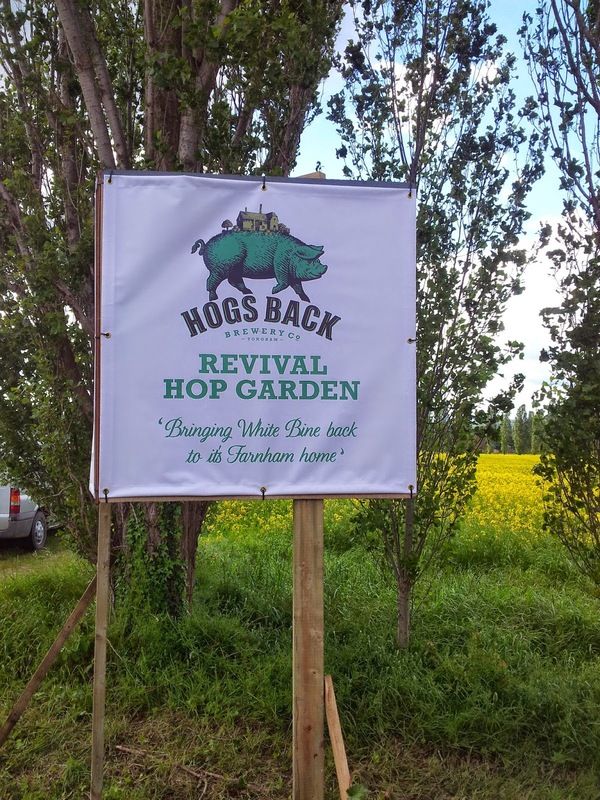 The Hogs Back Brewery is spitting distance from Badshot Place where Farnham Whitebines were first grown in 1750, so it really is an ideal spot. A history going back over 250 years does though raise the question of how close are the plants we have now are to the plants that were grown then? Like all venerable varieties they will have been re-selected, and are mostly known as Mathons now. In 1901 John Percival considered the Farnham Whitebine, Canterbury Whitebine and Mathon to be one and the same plant, though others saw small differences. There may well have been a mutation or two down the years, but it seems certain that the plants have continued to be propagated from cuttings, not grown from seed, so any variation will be minor, and being back on home ground the soil and the climate are the same. So I'm happy with that, and I can rest easy in my bed knowing that the Farnham Whitebines have indeed returned home. After Brewdog's latest spat with the Portman Group I put a poll on my blog asking if it was all bluster or if they really were prepared to take a financial hit. It was pointed out that there could well be commercial reasons for wanting that beer out of supermarkets anyway, which rather made the poll redundant. Still, it was interesting to see that only one person who voted thought Brewdog were fine upstanding men of principle, and everyone else though they were unscrupulous scoundrels. Perhaps it's time for Brewdog to drop the revolutionary rhetoric and re-brand themselves as the Gorodon Gekkos of beer. It seems in Australia they're clamping down on craftiness. SABMiller has been fined for contract brewing and distributing nationally Byron Bay Pale Lager with the words "Brewed in NSW by the Byron Bay Brewing Company and its Licensees" on the label. As the company that owns the brand seems to be a brewpub I think they were being a bit crafty in what they're saying there. Still, it seem to me it would still fit in with the American Brewers Association craft beer definition. The day has arrived again, so may I wish you all the best in your future struggles, and good luck with finding any mild.